Last weekend we looked after my younger niece and nephews whilst their Mum, Dad, sister and brother went to an early Halloween event. They all enjoy watching films so we decided to have a film night, normally they chose a film from our vast selection of DVD's but as I had just received a copy of Monster Island it seemed the perfect opportunity to watch it. 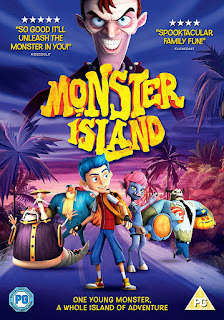 Monster Island is an animated film about a boy called Lucas who finds out he’s not really a human and the news changes his whole world, especially since his first monster transformation happens in front of the most popular kids at school! After unreasonably blaming his dad for keeping his identity a secret, the angry and embarrassed Lucas runs away from home. His search for Monster Island and his real roots take him on a fabulously scary journey that puts him face-to-face with more tentacles, fangs and far-out situations than he can shake one of his new wings at. Ultimately Lucas learns that being a freak, isn’t freaky - it means you’re a member of a brand new type of family, you can proudly call your own. All the children loved the film, they sat transfixed throughout and the only sound was their laughter which is always lovely to hear. It is a fun, entertaining film with a few good witty lines that is perfect for the whole family. With a PG rating, Monster Island is an animated film from the producer of Top Cat Begins, and the writer of box office hits Madagascar and The Jungle Book. The film features voice talent from Despicable Me and Khumba: A Zebra's Tale. Half term and Halloween are fast approaching so if you are looking for activities to keep your children occupied in the school holidays why not make some popcorn and have your own film day with Monster Island which is available to buy on DVD from the 16 October 2017. We received a copy of Monster Island for the purpose of this post.